One of my goals last year was to become better at meal planning. I also tried to eliminate as many processed foods from our diet as I could. It may seem like I make a lot of sweets around here, but most of the time they are for special occasions or special orders for friends, co-workers and relatives. Don't get me wrong - I love a cupcake or two, but moderation is key. I starting using this free printable meal planner and it really helped to keep me focused. I also have a "What's For Dinner" Pinterest board. Meal planning has made my evenings much less stressful. I absolutely hate it when I have to stop off at the grocery store on my way home from work. I rarely do that any more. Pesto Baked Salmon is a new to our dinner rotation, but we will definitely be having it at least once or twice a month. It's healthy, quick and delicious. I'd love to hear how you plan meals for your family and feel free to share some recipes too. I'm always looking for new ideas! Drizzle olive oil in the bottom of a bake dish or spray with cooking spray. Place salmon in bake dish and spoon 1 tablespoon of pesto on each fillet; spreading it around to cover. 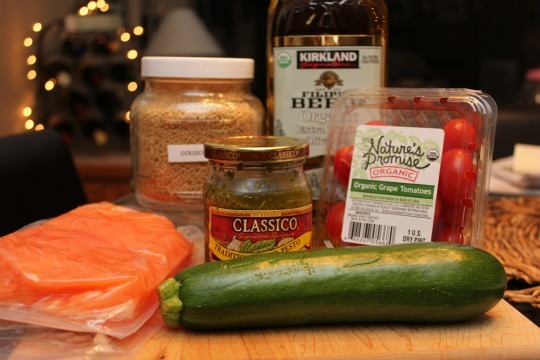 Place zucchini and tomatoes on top of and around the salmon. Salt and pepper if desired. Cover with aluminum foil. Bake for 20-25 minutes or until salmon is cooked through. While the salmon is baking make the couscous. In a medium saucepan bring one cup of chicken or veggie stock to a boil. Remove from heat and add couscous; stir. Cover the pan with a lid and let it sit for 10 minutes. Fluff with fork before serving. 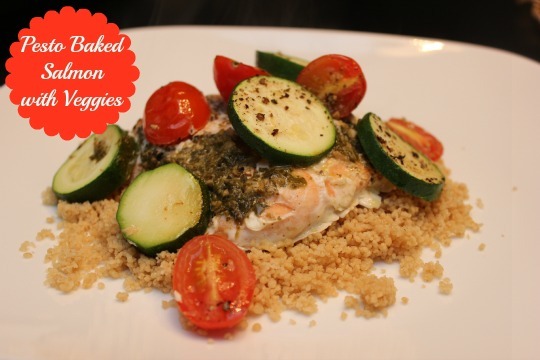 To serve place salmon and veggies on a bed of couscous. Serves 2-3 depending upon the size of your salmon fillets. I adore salmon!!! Love the pesto on it...AND the fresh veggies. Thanks Leslie. It's such a easy weeknight meal that I can feel good about eating - gotta love that!